It was a big premiere week for The CW’s shows, but they are following a trend we are seeing with most other returning shows. This season’s ratings are about in line with their prior season averages, but their premiere numbers are down year over year. And since the numbers typically drop after premiere week, that means we haven’t seen them bottom out yet. But these days it is much more important to gauge a show’s status based on where it stands against its own network’s programming, so the early numbers at least give us an indication of how they will track against like shows during the season. On Sunday, Supergirl led the charge for The CW’s return to Sunday nights and posted a 0.5 rating based on same day viewing for the 18-49 demographic with 1.5 million total viewers. That is down notably from the 0.9 rating the show for last season’s debut, but in line with its average last year and good for its competitive timeslot. In the lead-out hour, Charmed pulled a 0.5 rating with 1.6 million total viewers for its debut. I’m guessing the network hoped for better numbers from this high-profile reboot, but it should be happy with how both of its shows performed on an overoaded Sunday. Over on the cable nets, BBC America’s Doctor Who slipped a bit to a 0.42 rating based on the demo with 1.1 million total viewers. Those are still pretty good numbers for that show and the curious onlooker effect does not appear to have impacted it yet. On AMC, the Walking Dexit continues as TWD slipped to a 2.0 rating with 4.9 million total viewers, marking an all-time series low for the show. I don’t expect it to be cancelled this year, but its long-term prospects have definitely shifted and I will look at that in more detail in an upcoming post. Over on Disney, Star Wars: Resistance improved slightly to a 0.09 rating with 471K total viewers. That show could stick around if it is pulling in decent money from its merchandising. On Friday, Syfy’s Z Nation took a notable drop to a 0.14 rating with 511K total viewers, though I still believe that one will get at least one more season to get it to a syndication friendly count of episodes. Van Helsing improved to a 0.13 rating with 479K total viewers, and if it can hold around that level, plus get support from its fans on the social nets, then it might make it to a fourth season. Over on CBS, MacGyver improved to a 0.8 rating with 6.2 million total viewers and that one is almost certainly safe for a fourth season renewal because it is in the syndication stretch. On Thursday, The CW’s Supernatural returned for its 14th season and posted a 0.5 rating with 1.5 million total viewers. That is down a little from its average last year, but not by too much and this one is performing well enough for the fifth place network. Over on NBC, The Good Place dropped again to a 0.8 rating with 2.7 million total viewers. But it is performing on par with the network’s other Thursday comedies so it could still be okay. On Wednesday, The CW’s Riverdale returned with a 0.5 rating and 1.5 million total viewers. That is down from the 0.8 score it had for its Season 2 bow, but even with its average last year. This show performs very well in its encore run on Netflix and gets plenty of boost on the social nets, so consider it likely to get a fourth season renewal. On FX, American Horror Story held at a 1.0 rating with 2.1 million total viewers and also led the night among cable shows. On Tuesday, The CW’s The Flash returned for its fifth season and posted a 0.8 rating with 2.1 million total viewers. That is down 27% from its debut last year, but is in line with its Season 4 average and it remains the top-rated show on the network. Expect this one to likely race into a sixth season. 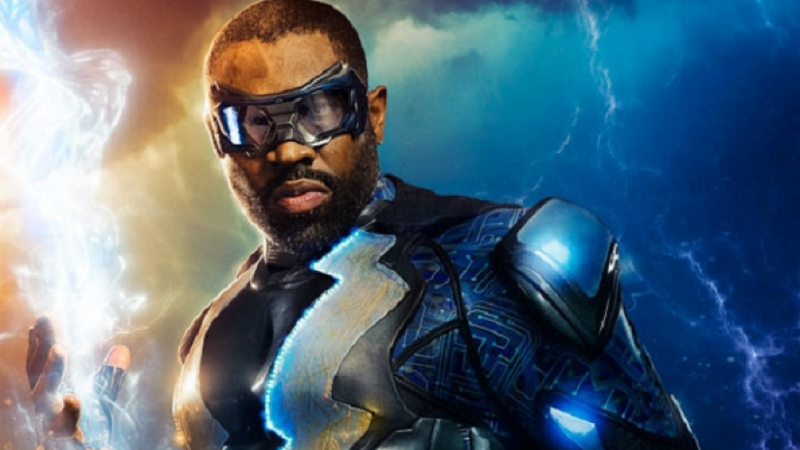 Black Lightning also returned that night and posted a 0.4 rating with 1.2 million total viewers. That’s down by 50% from its series debut and almost 30% from last year’s average, so this one could find itself in an iffy position considering it is only a second season show. Over on FOX, The Gifted remained low at a 0.7 rating with 2.1 million total viewers and it will be moving to Bubble status if it does not improve soon. The preliminary numbers from yesterday show that NBC’s Manifest slipped just a bit to a 1.5 rating with 7.5 million total viewers. That still has the show at a decent cruising altitude and I expect this one to get a full season pickup at any point now. News Roundup: The CW announced last week that its Summer series The Outpost will be returning next year for a second season. Netflix and Marvel put out a joint announcement that Iron Fist will not be returning for a third season, though they indicated that the character might be back at some point. Stephen Amell has claimed that the seventh season of Arrow is not necessarily the last for that show because he is contracted for at least one more year. In development announcements, CBS is working on a series based on the DC Comic Secret Six and NBC has started development on The Last American Vampire based on the Seth Grahame-Smith novel. Charmed (CW, Status – Renewal Possible): The CW might have hoped that this would have been their next big thing, but the early ratings are not that good. Still, it performed quite well in its highly competitive Sunday night timeslot and should charm its way to a second season if it does not slip too much. Doctor Who (BBCA, Status – Renewal Likely): This show is off to a strong start with the thirteenth Doctor (played by Jodie Whitakker) drawing in plenty of viewers to see the first female lead for the series. Expect the numbers to slip after the curious onlooker effect passes, but also expect this show to stick around for several more years. The Gifted (FOX, Status – Renewal Possible): The ratings are not tracking strong for this show early in the season, but it tends to do better in delayed viewing. If it can make it into the Top 25 based on the Live+7 numbers (we haven’t seen any delayed viewing stats for the season yet), then it might be okay. Manifest (NBC, Status – Renewal Possible): This one pulled very strong numbers for its series premiere and has experienced only a modest drop since then. If it can hold at or above a 1.5 rating, then it will almost certainly fly right into a second season. The Outpost (CW, Status – Renewed): The numbers for this one were low even for a CW series, but as an acquisition to fill up space on the Summer schedule apparently it did well enough because it will be returning for a second season. Supergirl (CW, Status – Renewal Possible): This show returned close to last season’s average and also did quite well for The CW’s first foray into Sunday night programming in a decade, especially considering how competitive that night is. If it doesn’t drop too much in the coming weeks, and if the network remains committed to its Arrow-verse shows, this one should soar into a fifth season. Van Helsing (Syfy, Status – Renewal Possible): This show improved some in its second week which keeps it from getting downgraded to Bubble status. Since it is a third year show not owned by Syfy (the network tends to cancel those, more on that at this link), it needs to keep its numbers at least at the current levels and fans need to make some noise on the social networks supporting it. The Walking Dead (AMC, Status – Renewal Likely): This show is now down to series low levels and its ratings woes have caused AMC’s stock to slip. It is still one of the highest-rated series on television, but network bosses won’t like the fact that it is dragging down the stock prices. It won’t be cancelled this year, but it may be ending sooner rather than later which I will look at in more detail in an upcoming post. Z Nation (Syfy, Status – Renewal Possible): This show returned for its fifth season with numbers slightly higher than its fourth year average but then saw those drop. It is inexpensive to produce and a sixth season gets it to a good episode count for a syndication run, though, so I would bet on it sticking around for another year at this point.